Russia's supplying S-300 missiles to Syria is a clearly hostile act towards Israel. On Sunday, Israeli Prime Minister Binyamin Netanyahu again addressed the changing strategic situation in Syria after Russia delivered its advanced S-300 missile shield to the army of Syrian dictator Bashar al-Assad. Netanyahu’s remarks came after his Minister of Regional Cooperation Tzachi Hanegbi (Likud) claimed the Israeli Air Force is able to overcome Russia’s latest hostile act against the Jewish state. Hanegbi last week said Israel’s new 'Adir' warplane, a modified version of the American Lockheed F-35 Joint Strike Fighter, was able to carry out combat missions against Iran-related targets in Syria without being detected by the S-300 anti-aircraft batteries. “You know that we have stealth fighters, the best planes in the world. These batteries (S-300) are not even able to detect them,” Hanegbi told Israeli media. Last week, Russia delivered the S-300 to Syria in the middle of the night but said it would take another three months before Syrian army officers would be able to operate the missile shield independently. It appears Israel is now working in tandem with the United States to counter the threat posed by the new Russian-made Syrian anti-aircraft batteries. During his meeting with US President Donald Trump on the sidelines of the United Nations General Assembly almost two weeks ago Netanyahu said he had “got everything he wanted from Trump” regarding the crisis with Russia over Syria. The Israeli-Russian crisis started after the Russian army falsely blamed Israel’s air force (IAF) for the downing of a Ilyushin IL-20 reconnaissance plane which was shot down with a S-200 SAM missile killing 15 Russian servicemen on Sept. 20. Trump reportedly okayed the immediate delivery of an additional number of F-35 stealth war planes - which are considered the best fighter jets in the world – to the Israeli Air Force, while for the first time deploying a squadron of US F-35s in Abu Dhabi. Both moves must be regarded as an attempt to neutralize the threat posed by the new S-300 anti-aircraft batteries to both the IAF and the US Air Force, which is supporting American Special Forces stationed in eastern Syria and northern Iraq. The Russians, meanwhile, are increasingly showing they are acting in Syria as Iran’s ally in its war against Israel and the US. After allowing the Quds Force of the Iranian Revolutionary Guards Corps (IRGC) to build new missile facilities and bases close to Russian bases in northwest Syria and stationing Russian forces on Quds Force bases, the Russian army is now also helping Iran to control the Syrian-Iraqi border. Russian forces deployed in the area of the border town Abu Kamal on Saturday according to the “Euphrates Post” and the Enab Baladi news agency. “Dozens of troops and armored vehicles affiliated with the Russian army have arrived at rural Abu Kamal, where they positioned in places near the Iranian forces’ posts,” according to the report. The same region, which is home to the US-operated At-Tanf base, was the scene of an unprecedented aerial attack by the IRGC at the beginning of October. Officially, the Iranians said the attack, launched from IRGC bases in Iran, was directed at the last Islamic State hub in eastern Syria, but IRGC commander Mohammad Saleh Jokar later revealed the assault constituted a message to the US and Israel. 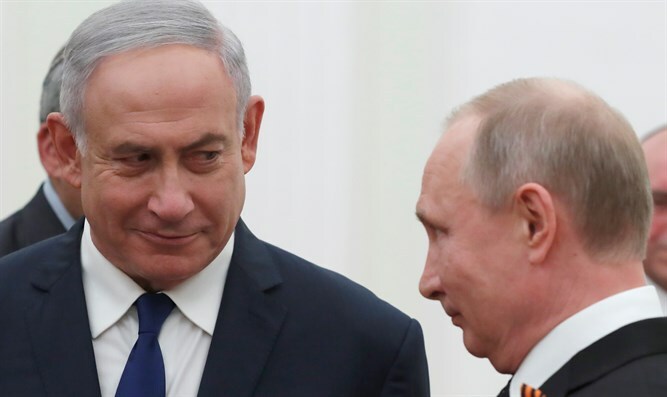 “The mask drops: Russia reveals itself as Israel’s enemy,” Yigal Carmon, the founder and president of the Middle East Media Research Institute (MEMRI) wrote in an article about the changing strategical situation in Syria for Jewish News Syndicate. “Now the picture is crystal clear: The Russians, who originally enabled and sponsored the Iranian expansion in Syria as an anti-US measure, will now also protect the Iranians in Syria from Israeli attacks,” according to Carmon. Russia’s latest actions in Syria show once again that Putin is trying to establish himself as the main regional power at the expense of Israel and the United States, even if this means harming Israel’s vital security interests. Netanyahu will therefore have a hard time changing the new reality in Syria, despite the delivery of the new American stealth fighters and his frequent visits to Moscow.